Celebrating the life of Hector O. Molina, Sr.
Obituary for Hector O. Molina, Sr.
Hector O. Molina, Sr.,79, passed away unexpectedly on November 12, 2018 in Boston, MA. He was the loving husband of Consuelo (Roman) Molina for 59 years. 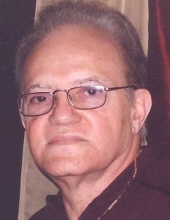 Born in Lares, Puerto Rico on August 12, 1939, Hector was the son of the late Juan Antonio and Josephine (Nieves) Molina. Hector was an extremely passionate family man of high character and integrity and was always there for his wife, family and many dear friends. He most enjoyed spending time with his grandchildren and would do anything and everything to support them. He enjoyed attending their sporting events and had a love sports in general, especially baseball. Since the 1950’s he was an avid fan of the NY Yankees. Hector also had a true love and appreciation for math and was often completing Sudoku puzzles. After moving to Connecticut earlier in life, he was a member of the Latin American Club and was involved in local politics. Along with his wife, Hector is survived by his son Hector Molina and his wife Zaida; and daughter Carmen Molina-Rios and her husband Edwin. He was predeceased by his daughter Damaris Molina-Torres. He is also survived by son-in-law Fred Torres; grandchildren Tessa Marie and Matthew Isiah Torres, Hector Joel and Lauren Gabrielle Molina, and Mya Alexandra and Gabriella Monique Rios; brothers Juan Antonio and Edwin Omar Molina; sisters Lydia Molina and Josephine Cardona; sisters-in-law Carmen Creel, and Carmen and Mirriam Molina, nephews Richard Creel, Kevin Molina, Danny Cardona, Duane Perrine; nieces Jazmin Molina, Melissa Gianmarco, Janet Cardona, Ivette Cardona, and Lizzette Rivera and many other beloved nieces and nephews. He was also predeceased by his siblings Luz Esther Sepulveda, Jose Manuel Molina, Fremain Molina, Aurea Molina Gerena and Samuel Molina. Relatives and friends are invited to visit with Hector’s family on Friday, Nov. 16 from 4 to 8 p.m. at Beecher & Bennett-Flatow Funeral Home, 48 Cook Ave., Meriden. Funeral services will take place on Saturday, Nov. 17 at 9 a.m. from the funeral home with a Mass of Christian Burial celebrated at 10 a.m. in St. Rose of Lima Church, 35 Center St., Meriden. Burial will follow in Sacred Heart Cemetery, Meriden. To share a condolence with Hector’s family, please visit www.beecherandbennett.com. To send flowers or a remembrance gift to the family of Hector O. Molina, Sr., please visit our Tribute Store. Burial will follow in Sacred Heart Cemetery, commital prayers will be conducted in the Mausoleum. "Email Address" would like to share the life celebration of Hector O. Molina, Sr.. Click on the "link" to go to share a favorite memory or leave a condolence message for the family.